Y'all know we got to change our ways of living, to some degree, to save the planet. So I tried this electric bicycle thingy, mostly because I lost my driving license for 12 months due to speeding (sorry everybody, wrong thing to do), therefore it hasn't been much kiting/buggying since nov. -17. This is proof of concept atleast. But not very convenient or super efficent, sadly. This particular bike wasn't very good, but very roomy in the cargo dept. Good thing I still had the barrow wheels around, dunno if the 18" would have fit. 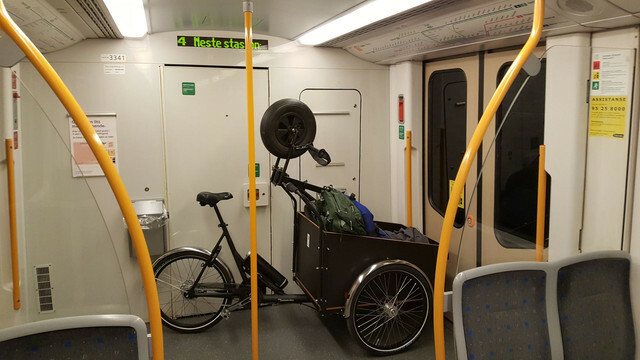 I rented an electric cargo bike, but field is ways uphill so I cheated with taking the metro up. Not too crowded on a sunday On the return trip I spent most of the battery anyways, it is not only downhill to get back to storage place (work). Figure out how to hook an electric motor and bigger battery to the bug and cut out the middle man! I think there was a discussion about that here on PKF a while back - this would be a perfect use for an electric bug. Awesome you can get that big thing in the subway - I assume you have working elevators there.